At the turn of the twentieth century, Frederick Novy was the leader among a new breed of full-time bacteriologists at American medical schools. Although historians have examined bacteriologic work done in American health department laboratories, there has been little examination of similar work completed within U.S. medical schools during this period. 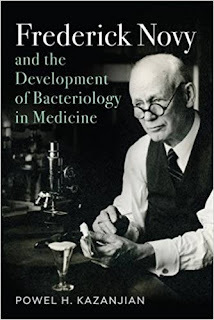 In Frederick Novy and the Development of Bacteriology in Medicine, medical historian, medical researcher, and clinician Powel H. Kazanjian uses Novy’s archived letters, laboratory notebooks, lecture notes, and published works to examine medical research and educational activities at the University of Michigan and other key medical schools during a formative period in modern medical science.